Before you approach Avebury Henge, one of England's most remarkable prehistoric sites, erase the image of Stonehenge from your mind. 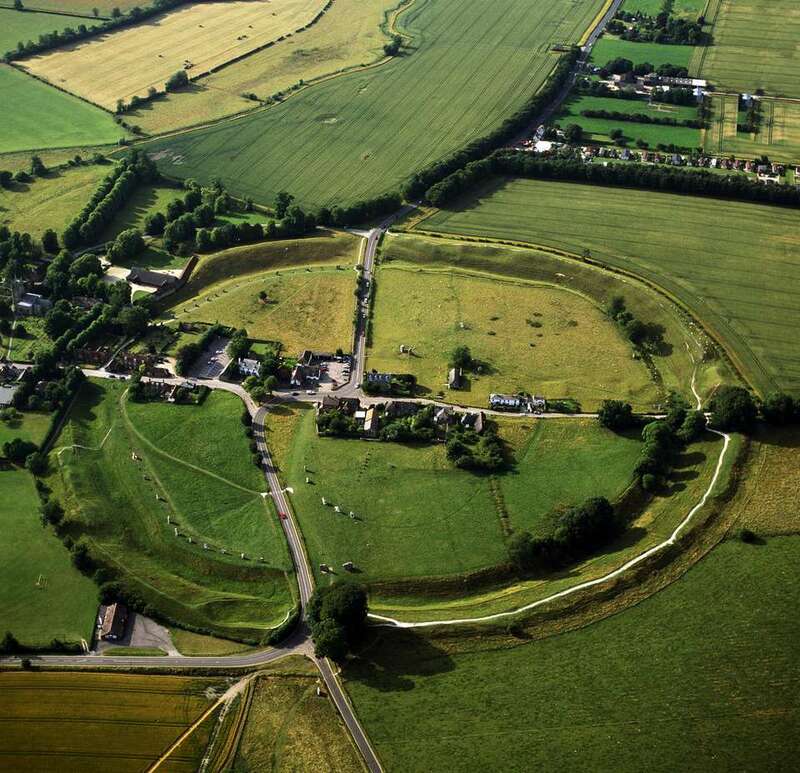 Also, take a moment to understand what a henge actually is, and the variety of things to see inside Avebury Henge will begin to make sense. Contrary to what you'll see at Stonehenge, a henge is not a collection of monumental prehistoric stones. Even the "henge" of Stonehenge is not the stones. It's the man made earthen bank, with a ditch inside it, that contains a large, flat-topped area. It rarely shows in pictures of Stonehenge because the bank and ditch are so far away from the attention-grabbing stones. At first, these banks and ditches were thought to be defensive structures. But scientists quickly worked out that a built up bank with a deep, wide ditch inside rather than outside it didn't make much sense. In fact, the best guess these days is that the flat-topped area enclosed by the circular or oval bank and ditch is actually some kind of sacred space, a place of ritual and perhaps sacrifice. The largest stone circle in Europe at more than 460 feet in diameter. At one time it was made up of about 100 standing stones. Two smaller stone circles, each about 100 feet in diameter. Many of these stones were toppled and buried in the early Middle Ages by villagers trying to erase the pagan origins of the site, probably on the instructions of the local parish priest. The Obelisk, a mysterious square stone recently discovered. When Alexander Keiller, an archaeologist and pioneer aerial photographer (he published Britain's first book of aerial archaeology), bought the 950-acre site in the early 1930s, locals were still plowing its features into the ground and making use of its stones as building materials. Keiller excavated many of the stones that had been toppled and where possible, he re-erected them in their original positions. In 1938, he founded a museum for his finds from the area. He also restored the 16th century Avebury Manor, just outside the henge. A wealthy and dashing aviator and academic as well as archaeologist (a sort of Scottish Indiana Jones), Keiller was married four times. Maybe he needed money for lots of alimony because in 1943, he sold the 950 acres to the National Trust for 12,000 pounds, their value for agricultural land. His fourth wife, who outlived him, donated the contents of his museum and his other archaeological finds to the Trust in 1966. Do enough digging in Britain's prehistoric sites, and you are bound to come up with some bones or burial goods. In 1938, Keiller discovered the remains of the Barber Surgeon of Avebury—his occupation as a barber surgeon was demonstrated by the tools of the trade he carried, including a pair of scissors and a medieval blood letting tool. It wasn't possible to determine whether he was killed by the stones or already dead when buried there, but for centuries, local oral tradition told of a traveling barber surgeon who arrived in the village when the stones were being toppled and buried on church instruction. According to the legend, he stood too close to a stone and it fell on him, crushing and burying him. That, according to the stories, marked the end of the destruction of the stones. Explore the standing stones up close: Unlike Stonehenge, where the standing stones are roped off and can only be approached with special permission, visitors can freely explore the stone within Avebury Henge. The main stone circle is enormous (more than three quarters of a mile around). Stone circle tours, led by volunteer experts are offered several times a day on most days. The tour costs 3 pounds (children are free) and takes between a 45 minutes and an hour. Visit the Alexander Keiller Museum: The museum, founded by Keiller himself in 1938 is divided into two sections. The Stables Gallery displays finds from the excavation of the site, including 4,000-year-old flint tools, domestic animal skeletons as much as 5,500 years old, some of the oldest European pottery ever found, and red deer antlers used as tools to build the henge and did the surrounding ditch. The child-friendly Barn Gallery, in a thatched, 17th-century threshing barn, has interactive displays putting Avebury Henge into context with the rest of the Stonehenge, Avebury, and Associated UNESCO World Heritage Sites. It also has a calm children's activity area where younger members of the family can settle down after running around the stones. Avebury Manor and Garden: The manor, just outside the henge dates from the 16th century and is part of the National Trust site. Alexander Keiller lived there while excavating the henge. Its rooms are decorated to reflect the five periods that it was occupied—Tudor, Queen Anne, Georgian, Victorian, and 20th century. Unusually for a historic house, visitors are encouraged to touch and interact with the furniture and objects in the house. You can sit on the chairs, lie on the beds, even play a game in the Billiards Room. The National Trust Hub: Naturally, there's a shop, cafe, restrooms, and information center in the Old Farmyard where you can find out what's happening at the site. Where: Near Marlborough, Wiltshire, SN8 1RF. The site is six miles west of Marlborough on the A4361. Parking is near the stone circles and National Trust facilities in the Old Farmyard. When: The stone circle and outdoor elements of the site are open every day, dawn to dusk. Hours for the museum and Avebury Manor vary with the seasons. Check the National Trust website for opening times. How much: Entry to the stone circles and outdoor features is free. The Alexander Keiller Museum is priced separately from Avebury Manor and Garden and there is an additional 7 pounds charged (in 2018) for parking. West Kennet Long Barrow, one of the largest and most accessible chambered tombs in Britain, is about two miles away. Built around 3650 B.C., it was in use for 1,000 years. Privately owned, it is managed by the National Trust on behalf of English Heritage and can be freely visited, every day, at any reasonable hour. Silbury Hill, the largest manmade hill in Europe and probably the most mysterious is 1.7 miles away. It is bigger than the Pyramids, and no one has yet worked out who built it or why. Stonehenge and its associated sites, Woodhenge and Durrington Walls, are about six miles away.